Below is the backcountry safety blog I wrote for Coaching Endurance. With the dangerous start to the Wasatch winter, our touring group has spent a lot of time talking about what has happened and what we think will happen over the next several weeks. As we discussed this, I thought it would be good to document some of our processes around decision making. With the first snow each winter, our touring group starts to get excited for winter. We get out during the early snow so that we can get a feeling for what that snow is doing. At this point of the season, we are interested in things like how much there is, where it is, any faceting that may have started, slides that are already occurring existing snow structure, any week layers that are present of are forming, and other factors. This information becomes very useful as some of the basis for our snowpack evaluations later in the season. We also use these early season days to do a lot of beacon drills since it is harder to spend time doing drills once there is great powder. By the time winter is really here, we feel comfortable with our gear and understand what the snow against the ground is doing. Within our group, several of us are very interested in the snow science factor. Because of this, we spend a significant amount of time digging pits and talking about the snow and snow structure, what has been happening, what we think will happen, and dozens of other topics that have tendencies of driving people less ‘snow geeky’crazy. We feel that it is because of these continual discussions that we are able to make good decisions, stay out of trouble, and maintain good group dynamics (we are usually all on the same page since we spend so much time discussing these item). For the past 3 years, the Utah Avalanche Center has put on the Utah Snow and Avalanche Workshop (USAW). As part of the UAC Observer Program, we are able to attend the morning professional session as well as the afternoon public session. The UAC does a great job of putting together a full day of workshops bringing together professional experience, new research, and presentations from accident survivors. This workshop is a great early season refresher for our group and is a chance for us to learn about some of the latest snow/avalanche research that is taking place. Analysis of 5 structural parameters in the snowpack to determine a relationship between these parameters and human triggered avalanches. Introduction of ALPTRUTh and FACETS to analyze Situational Awareness and Psychological Distractions. Our group uses both of these methods as part of our backcountry decision making. In this discussion, we will focus on how we use ALPTRUTh and FACETS methods as part of our decision making. Our touring group has always informally used the ALPTRUTh scale. This winter, we have decided to start formalizing our use of the scale. We each have a laminated copy of the ALPTRUTh scale below in our cars and we use it as part of our discussion as we drive to the trailhead each morning and on our ski approach. To use the ALPTRUTh scale in your evaluation (either before you start skiing or during your approach), you assign 1 point to each of the factors that exist in the area you will be skiing. Ian’s research has found that ~98% of accidents had a rating of 3 or higher and ~92% of accidents had a 4 or higher. There was also a surprisingly high percentage of accidents that had a rating of 5 of higher. Our group considers any rating of 3 or higher to be a reason for careful analysis of the decisions we will be making. The use of ALPTRUTh is just 1 of your decision criteria you should use to make your decisions. 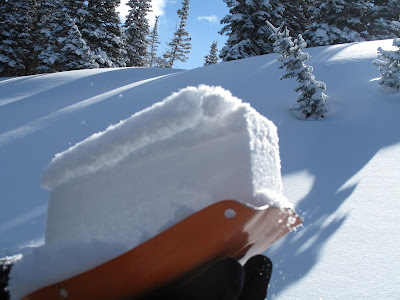 The ALPTRUTh scale incorporates what are considered the standard avalanche red flags: recent avalanches, heavy snowfall, wind loading, cracking, collapsing, and rapid warming. Ian’s data used for his study was from 622 recreational avalanche accidents (fatalities and not) involving 1,180 individuals in the US between 1972 and 2001. To incorporate Psychological Distractions into your decision making, use the FACETS acronym. The psychological distractions are more subjective, but should be used as you are making your decisions to help ensure your decisions are not being adversely impacted by these distractions. Most people have been in a situation where they are talking themselves into skiing a particular line. This is a perfect example of a psychological distraction. There is something telling you that you should not ski the line and you are telling yourself why it is ok. You should pay attention to make sure that you are not getting impacted by these psychological distractions while you make decisions. You can use the ALPTRUTh and FACETS Scale together to help determine patterns that you (or your group) may have in their decision making. To perform this analysis, look at 5 or more days (the more the better) that you skied and felt things were not perfect (bad decisions, close calls, group dynamic issues, etc.). For each day, add up your ALPTRUTh score and plot that with a dot next to each of the FACETS components that existed. Do this for each of your days and you will create a scatter plot. Most people (groups) will start to see a pattern over time. This pattern makes you aware of which psychological distractions that you are most influenced by. October 2–6, 2000, Big Sky, Montana, pp. 37 – 45. Penticton, British Columbia, Sept. 30 – Oct 4, 2002. With winter now setting in (the snow plows made their first trip through Summit Park on Tuesday and it was 16oF on Wednesday morning), it’s time to shift thinking to skiing (in reality, my mind rarely shifts away from this). I mounted Dynafit’s on Emily’s rock skis on Wednesday night with hopes of getting a walk in the snow on Sunday. I wanted to share my simple, low cost boot dryer. Our house is heated with a boiler so we are fortunate to have a small boiler room that stays very warm in the winter when the boiler is running. This room has always made a great drying room, but I had always wanted to design some type of fan that would force the warm air into the boots. It took several seasons before I finally got around to actually designing and building this. Fan: The key component for the dryer was the fan. This was why I kept putting off building the dryer, I did not want to buy a fan. Eventually I learned that many models of dish washers have small electric fans in them for the dry cycle. I was able to go to an appliance repair shop and remove the fan from a dish washer in their junk pile (beware – I am told the fan is a very common component that burns out on dish washers so double check that the fan you take actually works). Tubing and Couplers: The time consuming part of the boot dryer was spending time at the hardware store looking for various plastic tubing parts that I could use to attach the tubing, then reduce size to eventually split it out into 4 small tubes. Power: I had decided that I didn’t want to just plug the fan in and then have to unplug it (I was guaranteed to forget). I was hoping to find a 2 hour timer, but I was unable to find a low cost 2 hour timer, so I settled for a 1 hour timer (remember, my goal here was a low cost boot dryer). I used a cheap extension cord that I cut both ends off of, then wired it from the fan motor to the timer switch. I then used another extension cord with the female end cut off and ran it from the timer switch to the power source. Boot Rack: I kept this easy and used a scrap piece of 2×4 with 3/4” dowels drilled and glued into the 2×4 at somewhere between a 30-45 degree angle. I rounded the ends of the dowels to ensure the boot liners wouldn’t get damaged. I was able to easily mount the fan in my ceiling of my boiler room with 2 screws. I then attached the tubing across the ceiling and down the wall. I ran the smallest tubing up the dowels to blow into the boot. I kept this pretty simple (and ghetto) by just taping the tubing to the dowels. The rest of the tubing was attached to the walls and celling with a screw through the loose end of the hose clamps. I mounted the timer switch in a gang box directly behind the boot rack which was the most convenient location. I built this boot dryer last January and after 3+ months of use last winter, I have been very happy with it. I find that typically the boots will dry in an hour, but when I remember, I try to set the dryer for another hour. I have also found this works great for shoes, hiking boots, gloves, etc.